Sustainable Living: Help ‘green’ your Mason community! Below are a few things you can do to decrease your individual impact on the environment and Mason’s footprint. Use the cold water setting when washing your clothes to save the energy needed to heat up water. Use a drying rack or use wool dryer balls when doing laundry. Let your RA know if you are interested in the possibility of getting communal racks for the floor to use. Remember to turn off the thermostat when windows are open. Placing a reminder next to it can help. Also setting your thermostats high in the summer and low in the winter can save more energy. Turn off devices and lights when you leave your room! Ensure that your laptop is set to energy saving mode. This can be done in the “Power Options” on most computers. Unplug electronics such as lamps, chargers, printers, coffee makers, etc. when not in use. Appliances that are turned off but still plugged in will continue to use energy. Or plug all your appliances into a surge protector to easily turn them all off at once! Invest in LED bulbs for all personal lamps. They are more energy efficient and last longer! Check to see if appliances in the room are Energy Star Certified. If not, look into using Energy Star certified appliances in the future. 1) REDUCE, 2) REUSE, 3) RECYCLE is a hierarchy! The biggest gains in reducing our waste (#zero-waste), can be met by reducing the number of items we buy in the first place. A big part of that effort is saying NO to single-use items, instead investing in reusable ones. Refill your reusable water bottle at Mason’s water bottle refill stations located around campus – it’s free! Mason Nation has already used the refill stations over 2.5 million times. Let’s keep it up – don’t buy single-use water bottles! Purchase used clothes from thrift stores or consignment shops instead of buying new items. Or if you buy new, buy high quality items made in WRAP certified facilities. Learn more about the price of cheap fashion here: http://truecostmovie.com/learn-more/environmental-impact/. Make sure everyone in the room is aware of, and using the recycling bin. Also be aware of separating recyclable materials into the appropriately marked containers in your hall’s trash room. Mason accepts white paper, mixed paper, and comingled (glass, aluminum cans, and plastics # 1-7). Recycling electronic waste can be a little tougher. E-waste, such as batteries, ink cartridges, and old cell phones can be recycled in specially marked bins located on the 1st Floor of the Johnson Center. Use Eco-Friendly all-purpose cleaning products, such as ‘Seventh Generation’ or ’Method’. Student opinions matter: Let your voice be heard! Comment at dining halls and student centers asking for more vegetarian and vegan options/ days; and local produce and/ or meat. Try to eat less meat. The meat industry can be detrimental to the environment by using copious amounts of water, food, and land. Not to mention it contributes to TONS of greenhouse gases per year. For more information on the meat industry’s impact on the environment, visit http://www.cowspiracy.com/facts/. If/ when you do buy meat, try to buy local and organic. Mason’s follow me printing already helps reduce paper use by creating a second step in the printing process, but make sure if you have printers in your room, set them to “double-sided printing” by default. Join a sustainability-related group on campus. Meet cool people and help make Mason more sustainable! Here is a list of Student Groups including the Office of Sustainability’s own Green Patriots! 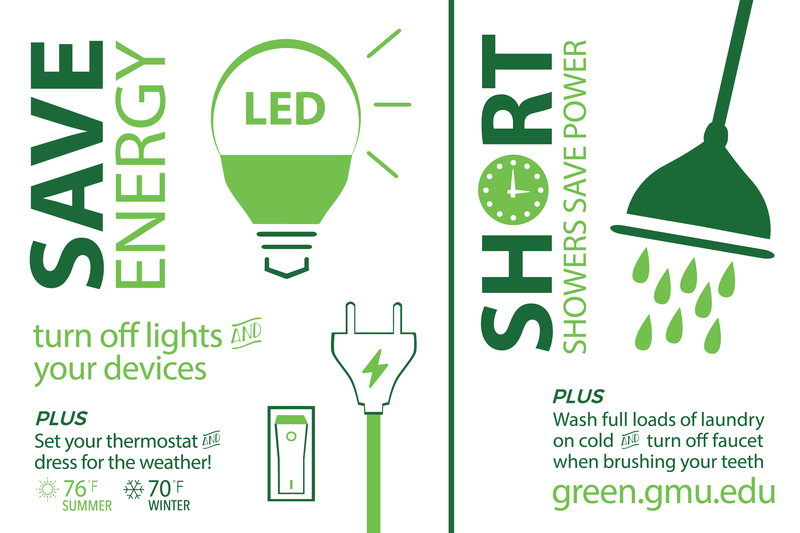 Learn more about why saving energy at Mason can help public health NOW: https://www.youtube.com/watch?v=KltAOzfVGAk.